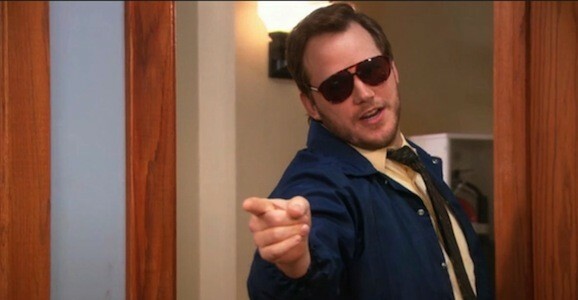 Before he was Star-Lord, before he battled genetically enhanced dinosaurs, and before he plays (maybe) Indiana Jones, Chris Pratt was best known for his portrayal of schlubby, loveable goof Andy Dwyer on NBC’s Parks and Recreation. That seven-year journey came to an end last night on the series finale, which was funny, touching, and almost everything you could ask for. But it also brought two of Pratt’s worlds together as eagle-eyed viewers may have noticed an awesome Guardians of the Galaxy Easter Egg. “On July 12, Andy Dwyer gets transferred.” It was only a matter of time before this happened, and now that Chris Pratt is in the process of becoming one of the biggest movie stars in the world, someone has mashed up the trailer for Jurassic World with footage from his most prominent pre-2014 role, as the lovable schlub Andy on NBC’s sitcom Parks and Recreation. This result is, of course, Jurassic Parks and Recreation, and it’s a damn fine time. Check it out below. You don’t normally associate NBC’s sitcom Parks and Recreation with science fiction. Sure, Adam Scott’s character Ben Wyatt is a total geek and has been known to expound on Star Wars, Star Trek, various comic book titles, and more, but outside of that, it’s pretty well rooted in the real world. You know, as much as any show on TV can be. As based in reality as it is, that’s not to say the gang from Pawnee, Indiana doesn’t have an eye on the future, and moving into their final season, they jump a few years beyond where we are now. And as you can see in this latest promo for the farewell season, it is a strange world indeed. We’ve also got a fun Parks and Recreation/Star Trek mash up if you’re interested in such a thing.